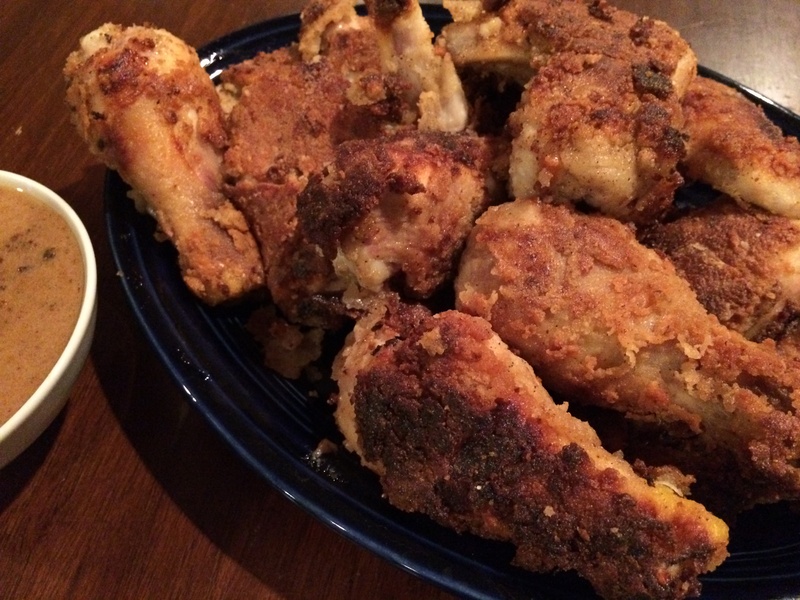 My daughter came home from somewhere I can’t recall and announced that she had just had the BEST honey fried chicken. My intense jealousy sent me straight to the store for cut up chicken pieces and buttermilk. Because you know, I WANT FRIED CHICKEN TOO. I’ve done the chicken and waffle thing before (recipe in my book) on the gf, so this is really adding a honey step for even more deliciousness. Fried chicken is one of those things that I truly missed the most when I was diagnosed with the sprue. Sure, I can make it myself and it’s not too complicated (says the girl who grew up with a grandmother who made it every time we were over), but I’m still super sad I can’t drive up to a joint and just dive in. Sigh. So this was fun to have around for a day or two including leftovers. I felt like I should have taken the extra on a pic-a-nic, but alas, we kind of don’t do that anymore. You never catch anyone packing up the cold chicken and potato salad with a checkered cloth and heading out to the woods. WEIRD. Why don’t we do that? We should do that. Regardless, I had some Hodgson’s mill gluten-free seasoned flour which I’ve used before, so I just added some corn starch for extra crunch (you can also use potato starch or tapioca starch). If you use regular flour, salt and pepper that stuff and throw any other spices in that make you happy. Maybe even some hot sauce. The end result? Awesomeness. Three words, you guys: Fried honey chunks. You should do this. 1. Place cut up chicken pieces into large bowl and pour buttermilk to cover. Allow to soak for 30 minutes. While chicken is soaking, place honey in a large pie plate, or lipped dish. Do the same with the flour and corn starch mixture in a separate, but similar container. 2. Pat chicken pieces dry’ish, and roll in honey first, then dredge in flour. 3. Heat vegetable oil in large skillet on medium-high. Turn heat to medium, and add chicken pieces so they fit comfortably. Cook on each side for 5-8 minutes or until brown, crispy, and cooked through. Remove and dry on a paper towel. Tags: gluten free junk food, gluten free recipes, gluten-free dinner. Bookmark the permalink. -Use canola oil, Crisco, or lard and cook chicken between 300-340 degrees (you left the temp out). Use a candy thermometer to keep the temp consistent. Very important in not burning or undercooking. -Use Cup4Cup gluten free flour. WAY better for fried chicken. Trust me, I’ve tried a ton of different mixes and this wins, hands down. OMG this looks so good! Definitely going to try it!!! I’ve made GF chicken strips before, but haven’t had it like this! Thanks for the recipe! OMGGGGGGG I can’t wait to try this!!!!!!!!!!!! !